Sure, boating is all about fun, sun, fresh air, the cool sensation of spray in your face, being with family and friends, and making memories to last a lifetime. And it is also about safety. Just like adults, children enjoy the freedom of being on the water and out in wide-open spaces. And, like adults, most children do not enjoy being confined in a life jacket. But it is not optional or debatable. And, in many cases, it is simply the law. 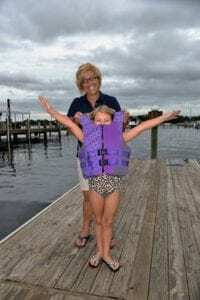 Here are the facts: Florida law requires all children 6-and-under to wear a U.S. Coast Guard approved Type I, Type II, or Type III personal flotation device while on board a vessel 26-feet or under. 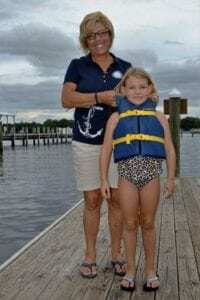 If you are going three miles or more offshore, every child 13-and-under must wear a life jacket. One captain I know, a longtime friend, requires his children wear life jackets every time they are on board a boat until they are at least 13. And another important factor: A life jacket has to fit properly. It is important to know your child’s weight to choose the correct size life jacket. Another important distinction: While on a boat, it is legal for a child to wear an orange (Type II) life vest. But that style vest is not approved for use during water sports, such as tubing or wake boarding. In fast moving water, such as after a fall off skis or from a tube, a well-fitting, properly-sized Type I life jacket is most effective. In those instances, Type II life jackets can wind up over the wearer’s head. Comfort and style certainly have their value, but safety comes first. As the good captain says: Better safe than sorry.